Lord Nelson’s snuff box which he gave to his Secretary, George Unwin, is for sale at Bonhams Gentleman’s Library Sale in London on 18 January. It is estimated at £4,000-5,000. This almost certainly dates the incident to December 1798 or very early 1799 when Nelson was in Sicily with the King of Naples and Sir William and Lady Hamilton whom he had rescued from an attack on Naples by the French. Although Nelson and Emma Hamilton already knew each other, it was on the island that they began their notorious affair and it is tempting to see Nelson’s act of generosity as a way of impressing his new mistress. George Unwin was a merchant and at one time Purser on HMS Prince George at the First Battle of Cape St Vincent and later Secretary to Lord Nelson. 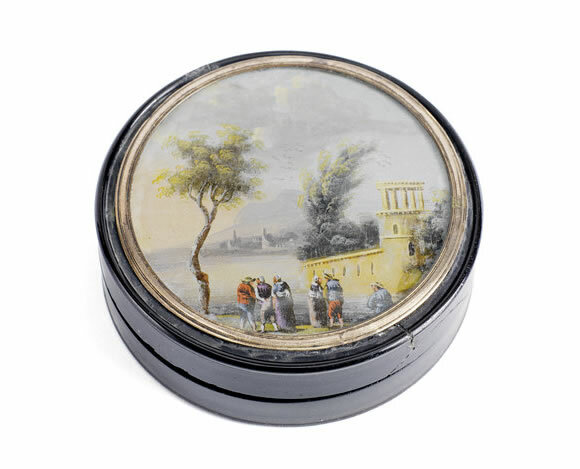 The box, which has a watercolour miniature of the Amalfi coast fitted into the lid, has been passed down the family via Unwin’s son George (the author of the letter) and then by descent via his wife Ann Oxenham to her brother Rev. William Oxenham and his descendants.